Prime Time Gala presents $173k to Feeding S.D. 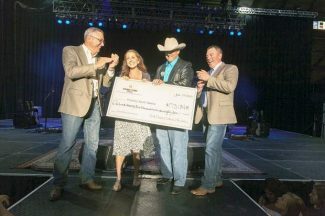 Sioux Falls, South Dakota (June 29, 2015) —The South Dakota Cattlemen's Foundation presented a check for $173,184 to Feeding South Dakota on Saturday night during the Prime Time Gala & Concert. This amount exceeded their original pledge amount of $125,000. Nearly 1,200 guests attended the second annual gala that featured Lucas Lentsch, South Dakota Secretary of Agriculture, as well as Benjamin Victor, the youngest artist ever to have a sculpture in the National Statuary Hall in the United States Capitol. The gala also included a silent and live auction as well as a raffle of a new truck from Woodhouse Auto Family. On this year's live auction was a custom-designed livestock trailer from Eby that sold for $35,000. After the gala, the night was highlighted with a country music concert at the Sioux Falls Arena with chart-topping artists, Tyler Farr and Billy Currington. "The results of the second annual gala were far beyond our expectations. It's humbling to work with so many volunteers and sponsors who are passionate about telling the story of beef production and care so deeply about helping those in need, said Ryan Eichler, President of the South Dakota Cattlemen's Foundation. "Because of their kindness and the generosity of all those in attendance, we will be able to provide the highest quality protein on earth to those who need it the most. I can't wait to dig into planning next year's event!" While protein is a critical part of any meal, it has made up less than 5 percent of the 12.5 million pounds of food that Feeding South Dakota distributes on an annual basis. High quality protein, like beef, plays an important role in overall health, including weight control, by increasing satiety and helping to build and maintain muscle mass. Because protein is one of the most satiating nutrients, eating a protein-rich meal or snack can help adults and children feel full longer to help reduce snacking on empty calories. The South Dakota Cattlemen's Foundation joined forces with Feeding South Dakota in May 2013 to create a signature event, Prime Time Gala & Concert, that raises critical funds for their mission by providing more beef to food insecure families throughout the state. In June 2014, at the first annual Prime Time Gala, the organization raised $115,831 for Feeding South Dakota. This year's donation exceeded the South Dakota Cattlemen's Foundation goal by nearly $50,000. "To see $173,184 written across the check actually took my breath away," exclaimed Matt Gassen, Executive Director of Feeding South Dakota. "This donation is so humbling and truly demonstrates the generosity of the South Dakota Cattlemen's Foundation and everyone involved in the cattle industry. This gift is going to help us provide at least 165,000 more pounds of critical protein to struggling families across South Dakota. This means that hungry families will be able to share a meal complete with beef protein, something you and I take for granted every day." Also revealed at the gala this last weekend is a new scholarship program. The South Dakota Cattlemen's Foundation recognizes that the future of the beef industry lies in the youth who have a sincere interest in the industry. These scholarships will be available for students pursuing careers in the beef industry. "We want those gifted and motivated young leaders to enter careers in beef production and allied industries," said Todd Wilkinson, President of the South Dakota Cattlemen's Association and board member of the South Dakota Cattlemen's Foundation. "We hope these scholarships will provide both the motivation and incentive to students." Additional details will be announced soon on scholarship guidelines and application process.